The project is consist of three system, is automatic hot dip galvanizing, environmental control system, logistical system, total project is based on environmental protection, energy saving and reduce manpower. 2. Auto logistical control system, can go on real time adjustment according to production beat, use resource efficiently. 4.All waste gas collection closed, centralized treatment and discharging standard, zero emission. 1. Zinc pot size:non-ferrous pot, ceramic pot 4×1×1m, capacity is about 26t. 5.Layout:loop shape,three across span is 6.5m, length is 36.4m,details in layout plan. 6.1 The max power of electrical equipments is about 500Kw. 6.2 In average 1ton production need 0.01m3 water, the pressure can't lower than 0.2MPa. 6.3 The PH level of water is 6.5 to 8, tap water, river water or well water is adoptable,mainly for supplementing consumption during production. 7. Environmental protection treatment system:waste gas and waster solid treatment for producing healthily. 8. Compressed air: bleed pressure 0.6Mp/cm2, air demand 6m3/h. 1.2 Manaully loading and unloading workpiece, other operation all run automaticlly. 1.3 All automatic equipments are set hand/automatic operation. 2.6 finally pour into discharge conveyor belt, storage after testing. 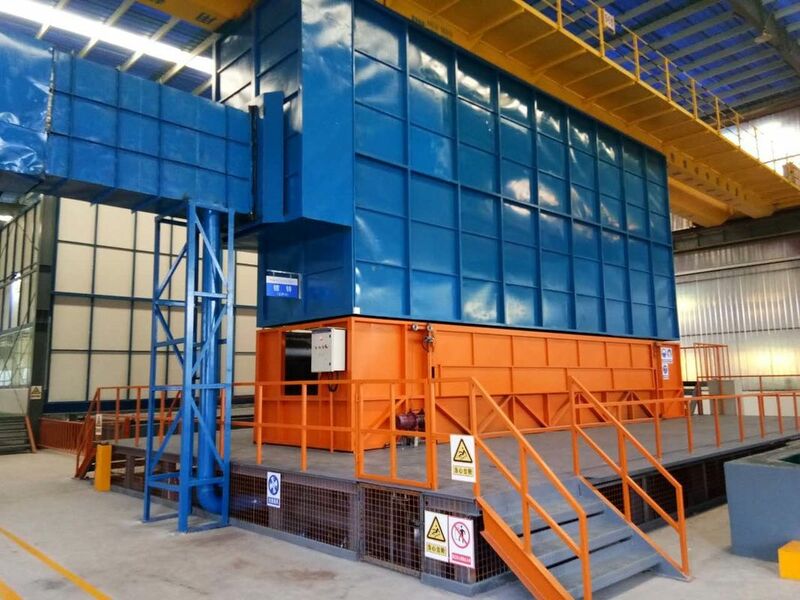 1.1 gantry type automatic travelling craneThe travelling crane is in the pretreatment seal room, travelling between both sides of tank. 2) equipment, facility corrosion prevention. Tank structure: make concrete foundation on the ground and preset anchoring strengthen for external use. Flux processing system ground anti-corrosion, pretreatment tank foundation ground anti-corrosion, cooling and passivation tank ground anti-corrosion. 1.2 Zinc tank heating equipment: to satisfied to production re quirement and consider molten zinc speed, is loading about 324KW by calculated. The equipment is adopting galvanizing spec ial heating rod made by international advanced silicon carbide rod, high hot efficiency, long servicing life, completely replace outdated quartz tube protection cover resistance wire heating. Each heater power is 18KW,380V, Y connection, total 18 groups. Each heater use SSR module, intelligent instrument control temperature by automatic accommodation. High controlling precise, trouble-free, maintenance-free. The inner circulation electric heating system. Transmission equipment, control immersing time according to production beat. Hydrochloric acid mist i mainly from the acid washing tank and flux tank vapor, is mixture of acid mist and steam. Sealed room structure: Stick profiling synthetic resin plate on the steel structural frame,can realize anti-corrosion more than twenty years, is custom-made sealed room plate only in our company. Insert transparent window on the sealed room wall, it is benefit workers who are on the steel structure platform to observe and operate working condition. Install flue on one side of acid tank wall and the distance to ground is 2.5m high, suction acid fog to acid fog scrubbing tower by induced draft fan. The acid mist flue acid mist washing tower in closed indoor treat acid fog produced pickling. 3 sets of collection system collect production of acid mist according to the actual capacity of the facilities, again through the alkali liquor spray and purifying washing system to purify it. Initial concentration of acid mist is about 43 mg/m3, after cover closed trap into the water spray absorber, hydrochloric acid mist purification efficiency is about 95%, after spray absorption of exhaust gas into the atmosphere. Both sides of sealed set entrance and exit in advance, Stick the corrosion resistant plate on steel structure, install Windows on both sides, can observe the conditions of sealed room.Cooling water sealed the same, in order to prevent moisture evaporation caused erosion of equipment. Choose induced high temperature resistance centrifugal fan, 1 set, rate of work is 11 KW, handling capacity: 7200m3/h. 1.project adopts TN - C - S electric control system . 2.adopt good grounding design, with electric protection measures such as short-circuit, overload, leakage.The design principle wire separately heavy current and weak current. 3.start, stop, control, and at the same time have current, voltage, running, stop instructions. 1.Provide design plan for hot galvanizing: technology diagram for hot galvanizing except workshop. 2.Provide material,equipment,electricity design,manufacturing, install and construction for the whole productionline. Work-shop and public equipments are excluded. 3.Providing debugging overall in productionline and people training.